(Before that) In the next day we headed for Pokhara. All the tourist buses to Pokhara set off at 7am in the morning from Kathmandu. So we got up early to catch the tourist bus. It is wise to book bus tickets a day before from your travel date to avoid last minute hassle. Endured 8 hours bus trip from Kathmandu, there was not much anything left to do on that day. During our stay in Nepal, we stayed varieties of hotels. 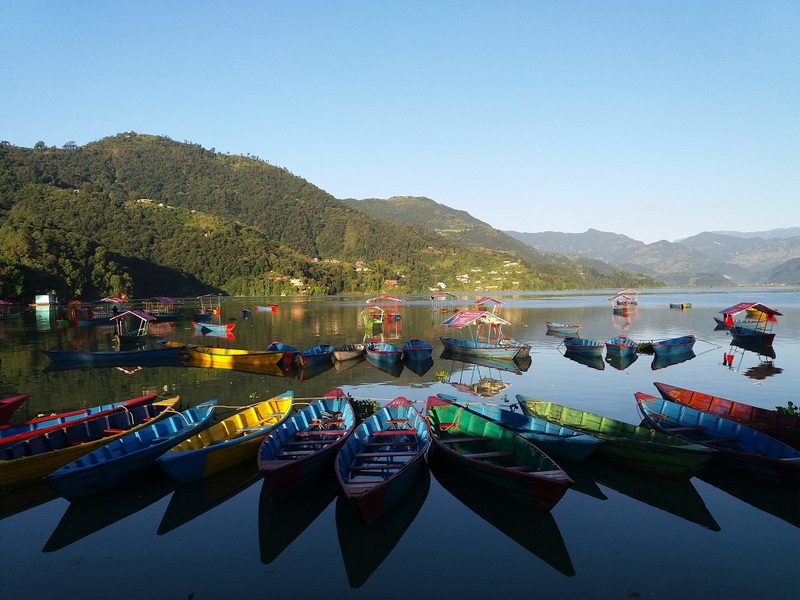 In a blissful morning at Fewa Lake, Pokhara. 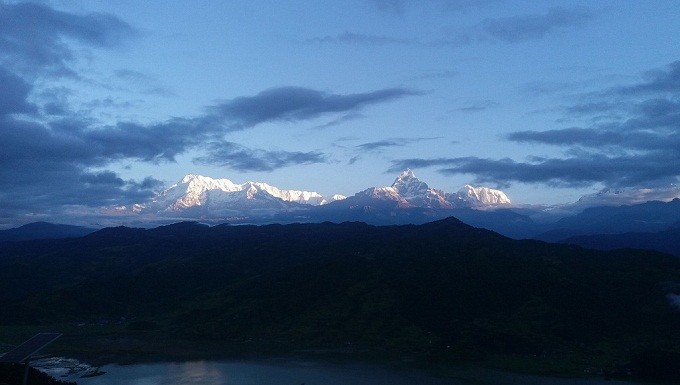 In Pokhara, our hotel was pretty nice with a clear view of snow capped mountains even from the bed. We spent rest of the day in lakeside Pokhara, stretching, relaxing and recharging our batteries for next few days of adventure. At AM/PM café we met our travel agent Mr. Happy, owner of Happy Village treks and expedition pvt. Ltd. He is an amazing guide; very witty and friendly. He greeted us saying ‘Namaste’ which directly translates to ‘I salute the God in you’. Nepalese people greet same like Indian saying ‘Namaste’. Sitting at a quiet restaurant, we reviewed our next few days itinerary with Mr. Happy. Day 3 in Nepal: Our tour bus arrived at hotel around 4 am in the morning. We packed our backpacks for our first sightseeing trip around Pokhara city. Plan was to see the sunrise from World Peace Pagoda. 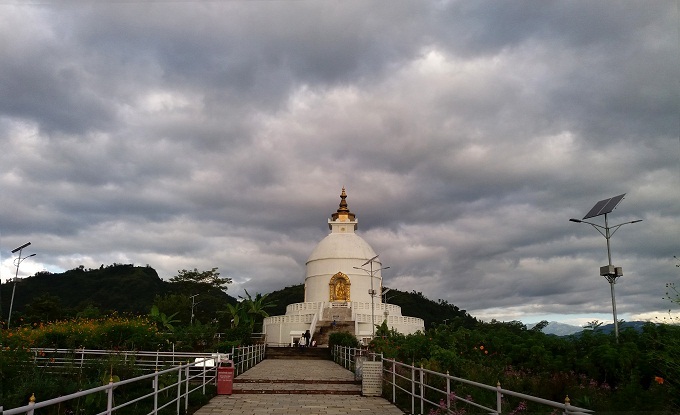 It is one of the best tourist attraction spot in Pokhara; local name ‘Shanti Stupa’. Nepal has two peace pagodas among eighty peace pagodas in the world; one in Lumbini, the birthplace of Buddha and one in Pokhara. We arrived there before the dawn. This white pagoda has two tiers for tourists and pilgrims to circumambulate which means you have to walk clock wise. Second tier has four statues of Buddha: ‘Dharmacakra Mudra’ from Japan, ‘Bodh Gaya’ from Sri Lanka, ‘Kushinagar’ from Thailand and ‘Lumbini’ from Nepal. Echoing Buddhist mantras from pagoda’s monk’s ritual practices created spiritual ambiance on the top of Ananda hill. World Peace Pagoda at Pokhara, Nepal. We were waiting patiently at hilltop to see the golden peaks of Annapurna. When the first light of morning kissed ‘Machapuchare’ (Fish Tail) mountain of Annapurna range, I was stunned and lost for words. The early morning sunrise spread across the blanketed landscape and was falling gently over Pokhara valley and clearing the misty fog to offer a panoramic view of it. The first light of morning kisses ‘Machapuchare’ (fish tail) mountainWe had our breakfast in one of the hilltop restaurant there with stunning view of Pokhara valley, lakes and Annapurna range. There are many trails for hiking to reach this pagoda. Most popular we saw people coming by local boat crossing Fewa Lake and then ascending hilltop through local village but we did the opposite. It was small hike descending from hilltop to reach for boats at Fewa Lake. We got on our hired boats and crossing the gentle Fewa lake slowly. At night we went for movies at Movie Garden, Baidam Rd, Khahare. North Lakeside. It’s a chilling place set out in open air. You can have your drinks from the bar, get something to eat and watch movies on their projector. We had our big dinner at OR2K restaurant that night; one of the top ranked restaurants in Pokhara. I loved the ambiance of the restaurant, not to mention about their food.